The collection of Indian miniature paintings at the Chester Beatty Library (CBL) that forms CBL In 11A, contains 99 single folios from the Mughal era, dated from the late 16th to the mid-19th century. The folios include portraits of Mughal emperors, courtly scenes, natural history subjects and daily life. They are striking in their appearance due to the brilliance of the pigments used and the detailed nature of the paintings. 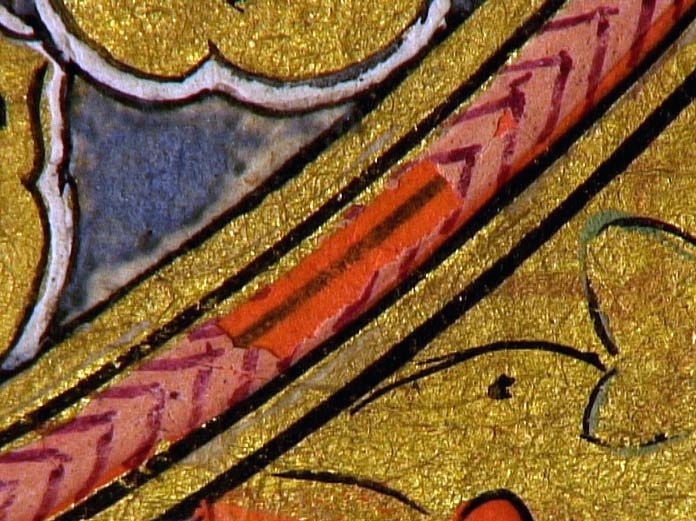 The folios are often double-sided with both images and calligraphy, usually inset into highly decorative and pigmented borders. They were probably originally housed in bound albums, however, when sold at auction, they were often detached from their original bindings and sold as individual items. Seed pearls and (perhaps precious) stones adhered to In 11A.69, Women on a Rock Slide, c.1760. Following a request for access to a number of folios from this collection from a reader, I carried out an initial condition assessment. The decision was taken to conserve the entire collection, most of which had not yet been treated. Approximately half of the folios in the collection were adhered to acidic mounts with a full hinge along the left-hand edge, whilst others were mounted between glass plates, and a number were found loose without any form of mount. The folios were carefully removed from their unsuitable historic mounts and examined visually. 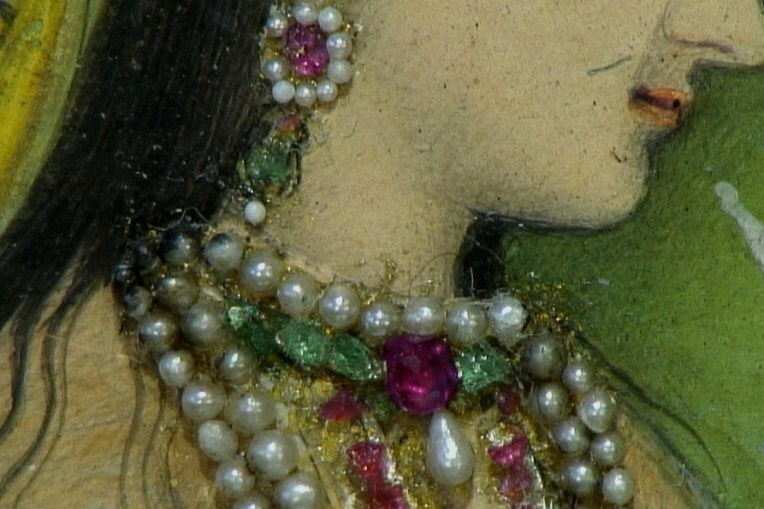 The sheer quality of the pigments is one of the first observations I made when examining these paintings. This has led me to become interested in the chemical make-up of pigments, which I will further study at the Montefiascone Summer School later this month. Examination of the folios was carried out using an Inspex High Definition digital microscope from Ash Technologies Limited. This microscope provides magnification of the object directly onto a large screen for detailed image analysis. This allowed me to determine which conservation treatments were needed. Consolidating In 11A.67, A Dejected Mistress, 1755-1760, with localised brush application of Bermocoll. The first step in conserving these paintings was the consolidaton of flaking pigments, which prevents further losses of the pigment layer. This is carried out using Bermocoll, which is a cellulose-based adhesive. A 1% solution was applied using a brush and a 0.5% solution was used in the nebuliser, which disperses the consolidant as a fine mist. Other additional, but infrequent treatments on these folios have included infilling areas of loss, and tape and/or adhesive removal. Pink pigment loss revealing under-drawing in In 11A.73, Ganesa and his Vehicle, 1800-1810. Tears and other areas of damage have been repaired where necessary using a dry concentration of wheat starch paste and Japanese paper. The preservation of the In 11A folios is still underway, and the folios are currently in the process of being hinged into their new conservation standard mounts. This project is generously being supported by the Library’s members. Delamination of the paper support from In 11A.73, before, during, and after treatment. During Heritage Week in August 2015, I will give a talk about this project. I will present a number of case studies and give more detail about the specific conservation challenges of these beautiful objects. Puneeta’s presentation will take place in the Lecture Room at the Chester Beatty Library, at 1.10pm on Thursday 27th August.